From her platinum blonde hair to her red, red lips, Gwen Stefani is a style diva. Other stars have tried to mimic the look, but no one pulls it off quite like she does. Find out how to get that look for yourself. Gwen Stefani's style is the perfect combination of attitude, glamour, and a tribute to Hollywood's golden age. She has a very clean yet bold makeup style, and she has made a few techniques and colors her personal trademark. Gwen manages to channel the flirtatious style of Marilyn Monroe by emphasizing her best assets and keeping the rest simple. 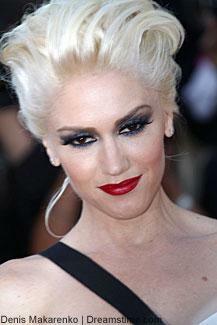 Gwen Stefani is notorious for wearing red lipstick. No matter what the occasion is, whether it's lighting up the red carpet or romping in the park with her two children, Gwen rocks her red lips with confidence. Red lipstick doesn't have to be tricky to wear or intimidating to select. There are hundreds of varying shades of red lipstick available in the cosmetic market. The key is finding the right shade of red lipstick that flatters and suits your skin tone. Fair-skinned individuals tend to look best in blue-based reds, while warm-skinned women look vibrant in fire-engine or orange-based reds. If you're just not into sporting a full red pout throughout the day, yet crave the distinct glamour of the shade, simply apply your red lipstick and gently pucker your lips on a tissue until the color is a transparent wash. Another option is to check out the versatility of a lip stain, which will gently stain your pout the perfect shade of red without the need of high maintenance application. With the focus on ladylike glamour, the eyes should be kept clean and sultry. Gwen wears a classic cat eye and keeps her lids clean with a shimmer shadow. Although many women opt for a liquid eyeliner when creating a cat eye, cake eyeliner (paired with waterproof sealer) is an easy-to-apply alternative that really captures the look of a bygone era. It also provides the control needed to master the signature cat eye swoosh. Next, a liquid-to-powder shadow formula creates creaseless color that has a vibrant sheen that highlights distinct areas such as the brow bone or a generous crease. Finally, set off those peepers with a heavy dose of black mascara to separate and add volume to fine lashes. For best results, use an eyelash curler prior to application. 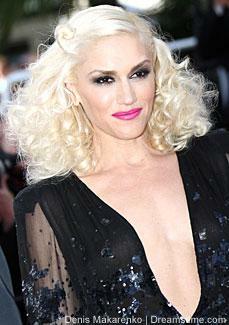 Gwen Stefani is blessed with a gorgeous, porcelain skin tone that enhances her retro look. Use a matte or semi-matte foundation to recreate her style. When choosing a blush to complement the rest of this makeup style, look for a peachy pink shade that will instantly perk up your complexion without imparting too much color. Now that you know how Gwen Stefani creates her style, it's time to try it out for yourself. Just keep in mind that you're special in your own way, so you don't want to simply copy Gwen. Always choose colors that go well with your skin tone, and don't be afraid to experiment a bit. Take a page from Gwen's book and allow your own personality to shine through so you're wearing your makeup, and it isn't wearing you.